You get a sports radar, which enriches every workout and that is variably designed. The V-MAXX is versatile and easy to use. 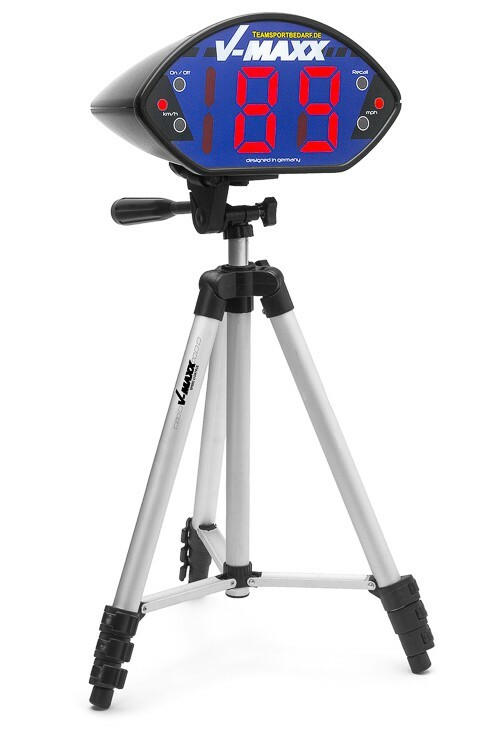 Lightning fast speeds are calculated with the use of Doppler radar measurement and are prominently displayed. 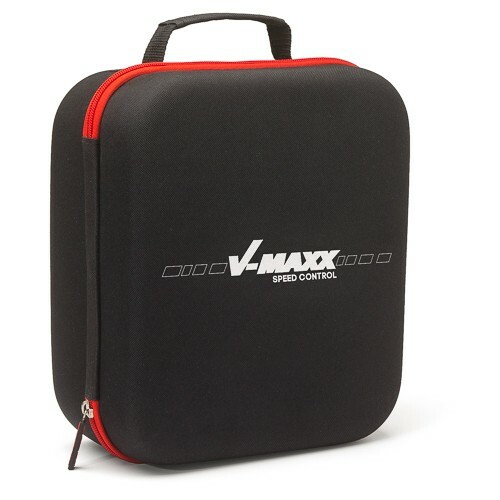 V-MAXX is extremely reliable and easy to use. 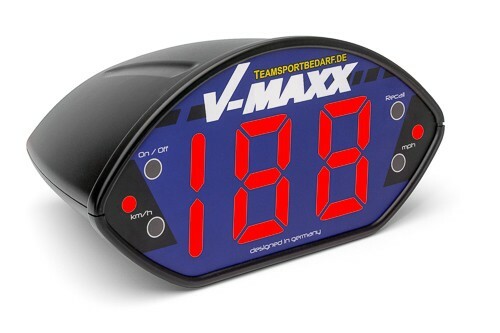 In training, V-MAXX can motivate higher performance, by measuring the sprint or the shooting power in football, for example. V-MAXX has a special highlight for events and show. A measurement of the shooting power can turn normal shooting practice special competition and guarantees fun. V-MAXX has Doppler Radar capability. When switched on, it sends out waves with a wavelength of 24.150 GHz. If they hit the moving object, the waves are sent back. From the time difference until the arrival of the reflected waves, the device calculates the distance. From a variety of measurements per unit of time, it determines the variation in the distance and it quickly calculates the speed. The maximum speed is 1.5 km/h. The emitted waves can penetrate into various materials by the high frequency; thus, a measurement behind nets is possible. 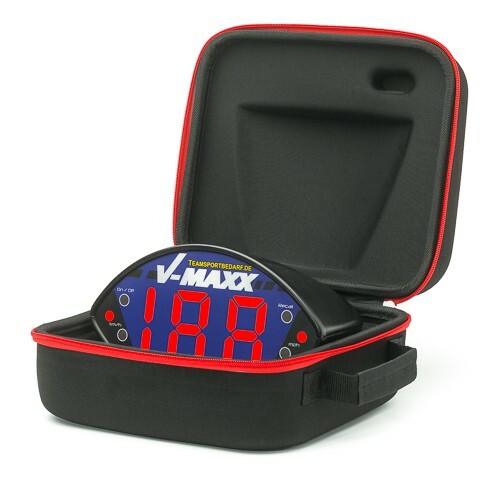 To measure your speed or the speed of an object place V-MAXX so that you or the subject is moving towards it. Note that people (e.g. 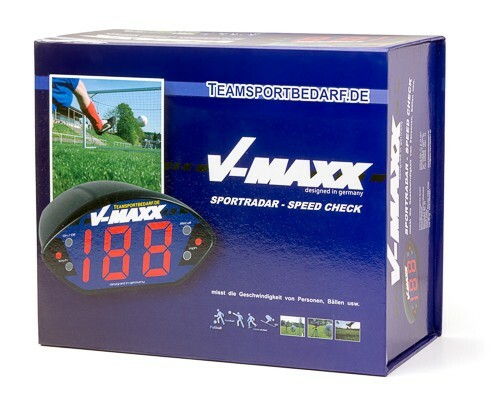 a goalkeeper) or an object between V-MAXX and the detection area can hinder the measurement. Large detection angle Best accuracy in an opening angle of 80 degrees in front of the V-MAXX. When you turn it on, all LEDs light up. When not used, the V-MAXX switches off automatically after 15 minutes. The tripod is not included but can be purchased in our shop.